In a world full of endless inspiration and incredible design we found that these are the pieces that are true investments to your space. Made of grade-A teak wood, crafted with commercial quality, and finished with performance fabrics, the Club Chair has a simplistic nature and genuine livability that is an essential part of ones living space. These chairs are grand in size, appropriate to use in a variety of settings, and have the ability to easily adapt stylistically. We’ve chosen our top five grade-A teak Club Chairs to share with you and to inspire. And we can’t forget! One of the best things about these amazing club chairs is that the Sunbrella® cushions are included as shown! You can choose the color that you like from our Sunbrella® fabric range. Sunbrella® cushions are the best in the outdoor furniture industry and we are proud to supply them with our deep seating pieces. 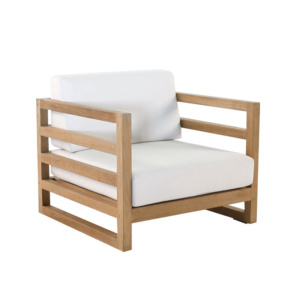 Designed with thick slats of grade-A teak wood, held together by stainless steel rods, and perfectly proportioned frame, this chair exposes the gorgeous grain detail and color of the teak wood. The Soho Club Chair displays the wood with each of the paneled sides, keeping with the traditional design, all while creating a seamless look. 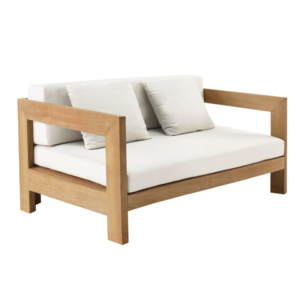 Grade-A teak wood is the premier choice in the outdoor furniture industry. The benefits of this wood include; stability, durability, high oil and rubber content, and resistant to insect damage. The Soho Club Chair is a timeless piece, much like the wood that it is made with. The teak used for these pieces come from government-controlled forests in Indonesia that are in accordance with sustainable forestry practices. These teak plantations are regulated to only allow a limited number of teak trees to be harvested annually as to promote the farms reforestation. 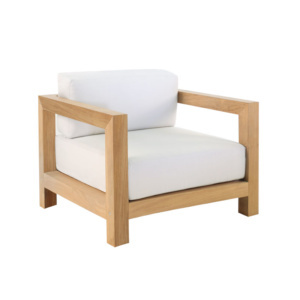 This grade-A teak chair is a classic piece that translates to a variety of spaces and the durability of its materials will ensure it will last for many years. Bright and polished, the Ibiza Club Chair is ultimately classical while maintaining a contemporary and robust spirit. It’s perfectly proportioned, open side paneling and backing, with a midcentury modern design takes this piece beyond its simple aesthetic nature and brings form and functionality to a space. This effortlessly balanced chair makes it the appropriate choice for commercial spaces. It’s easy to imagine a group of four Ibiza Club Chairs surrounding a low coffee table out on the terrace of a coastal resort. The grade-A teak wood makes for stable and durable pieces that have a weight ideal for such spaces. Commercial environments differ from residential in such that they will need a high resistance to wear and tear. We build all of our pieces with these guidelines in place, knowing that each piece is made with non-corrosive materials and UV-resistant fabrics. Immerse yourself in a cloud of spacious comfort. The Coast Club Chair is made with extra wide and deep seats, where one can find a serene and calming refuge to stretch out and relax. Stylistically traditional, this club chair makes a major impact. The Sunbrella® cushions are the most exceptional performance textile. These fabrics are engineered to provide resistance to fading and degradation from the sunlight and chemical exposure. Sunbrella®, as recognized as a leading performance fabric, is tactile yet durable, easy to care for, and offers longevity. The comfort is unparalleled and remains our first choice in outdoor fabrics. With proper care and maintenance, these pieces will last for many years. The architectural influence of the Manhattan Club Chair exists as a piece that takes on a bold scale with an angular form and crisp lines. The geometric composition takes on a fun and carefree mood while bringing style and superb craftsmanship to a space. The Manhattan Club Chair has a style that’s a bit edgy next to its more traditionally designed counterparts. The teak frame is eye-catching and has a polished and sophisticated vibe. Create symmetry in your outdoor space with several Manhattan Club Chairs. With a commanding presence, the Cabo Club Chair is our most proportionally generous piece on our list. Influences from a midcentury modern aesthetic blend seamlessly with its refined frame. 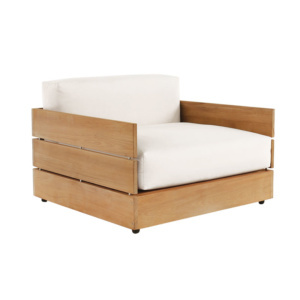 The stilted legs and crisp cushions provide a modern élan that’s hard to resist. With the three-sided cushioned paneling, the comfort is superior and takes on a strong yet unimposing grace. The Club Chair is a piece that’s meant to be lived in and meant to last. 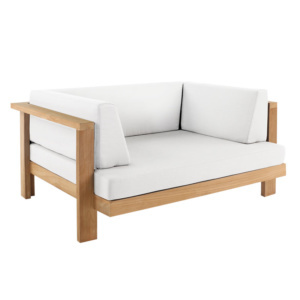 Each of our pieces are made with the highest quality of grade-A teak wood, accompanied by the leading performance fabric Sunbrella® cushions, and built with superb craftsmanship. Whether you have a commercial space or a residential space, these chairs will bring out the most in your space. Teak Warehouse has an extensive collection of club chairs to bring livability and cohesion to each space. Browse our online catalog to view each piece or visit our showroom in person. We are open daily and look forward to speaking with you. Call 800.343.7707 or email us at [email protected] Or submit a quote request today!